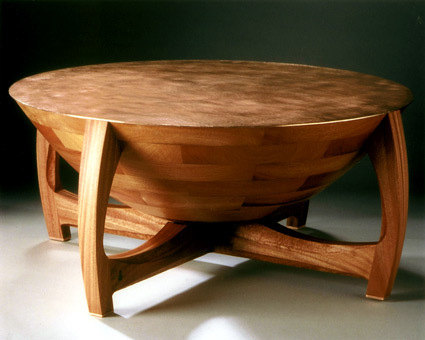 17½” tall and 39”in diameter, hand hammered copper table top, South American mahogany bowl, African mahogany frame and copper feet. The hand hammered copper top was fabricated by Roycroft Master Artisan Ron VanOstrand. This series is inspired by Charles Rohlfs, a designer and craftsman in Buffalo, New York in the early 1900’s. One of the pieces he designed was a coal hod, a semi-spherical container to hold coal for stoves.